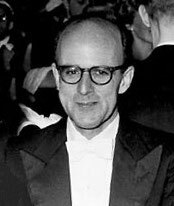 Max Perutz (19 May 1914 – 6 February 2002) was an Austrian chemist, one of the founders of X-ray crystallography of proteins, and in a broader sense of the fields of molecular biology and structural biology. Perutz was a Fellow of the Royal Society and was made a Companion of the Order of the British Empire in 1962. He was also an honorary member of the American Academy of Arts and Sciences. Perutz, with John Kendrew, received the Nobel prize in chemistry for "their studies of the structures of globular proteins". Could the search for ultimate truth really have revealed so hideous and visceral looking an object? The Hemoglobin Molecule, Scientific American, 211, 65-76, November 1964. This comment refers to the appeareace of the low resolution structure of hemoglobin, which Perutz was instrumental in elucidating in a heroic effort that spanned 1937 to 1959. In the course of this work, Perutz and his co-workers developed many of the techniques that are used to this day to determine the three-dimensional structures of macromolecules. This page was last edited on 26 October 2018, at 16:42.